Many of us are familiar with True Match foundation by L'Oreal. 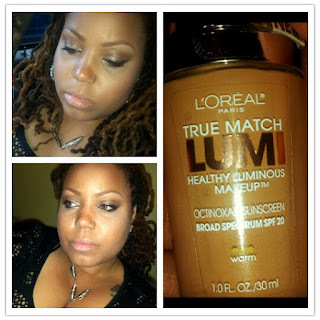 Now comes an updated version of this foundation now titled: L'Oreal True Match Lumi Healthy Luminous Makeup ($13). This foundation is said to contain 3 powerful ingredients to improve your complexion: 40% water for hydration, vitamins C and E... AND liquid light technology for a luminous finish. Like I said in my review of the Maybelline BB cream, regardless of being oily, I opted to try this foundation even though it claims to be luminous and hydrating... #deathtooilygirls. Read on to see my thoughts on this foundation. My sister, Toni P, uses True Match as one of her go to foundations after her favorite HiP foundation was discontinued. I haven't tried the original True Match, but knew I wanted to get my hands on this formulation. L'Oreal seems to have come out with this new Lumi line, which in my opinion competes with Revlon's Photoready line. Photoready foundation adds a bit of sparkle to our favorite ColorStay foundation and thins it out "at the same DAMN time"-- sorry for the FUTURE reference; I can't help it these days, LOL. Same with True Match Lumi; it has a bit of sparkle in it for the luminous finish, when original True Match is sans sparkle. When I applied the foundation (with my MAC #130) it goes on thin and is wet. The 40% water, perhaps? You have to give it a second to dry down (similar to MAC's Prolong Wear foundation). Even though I'm oily, this luminous finish didn't bother me. The foundation looked and felt more natural and polished in real life. In pictures, it's a bit more luminous... "Blot that T-zone!" See my pictures above for reference. I would have bought this foundation sooner if I didn't feel confused about which foundation was right for me. I ended up with W6 Sun Beige for my NC44 skin tone (really NC43 if it existed). This shade seemed to be my best bet. I wish this foundation was a touch richer in color pigments, but this matched me decently enough. I'm not sure if that will be the case for everyone. This foundation makes a nice addition to drugstore foundation options. Have you tried this foundation. Do you prefer it to the original True Match formulation? 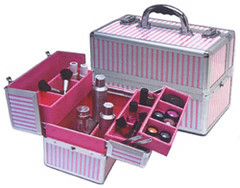 this looks great on you! i've never tried a drugstore foundation, but I'm leaning towards this. it'll probably be pretty good on my sometimes dry skin. great review. @ 1xellus1 thanks! select spf is that tinted moisturizer? thanks! does "sun beige" looks yellow or have pink undertones? I HVE DRY SKIN AND IT BROKE ME OUT!! !